Pastel is a medium I have always dearly wanted to master but have never quite gotten a handle on. I’ve seen masters such as Jean-Étienne Liotard or John Singleton Copley who did portraits in pastel that look like photographs and I’m like, “How did he do that?” My few tries with pastels ended up with most of it on the back of my hand. Enough said, I can’t do pastels. But, Pierre Prins could do pastels. As with the above mentioned artists, I’m like, “How’d he do that?”! Unfortunately, he is one of those artists who has been more or less ignored in the history of art because his work plays a sort of side step to what was happening at the time: Impressionism. Despite that, his work compares favorably to Impressionism, and at the same time the Impressionists were prowling the environs of Paris for subject matter, Prins was right there with them. The Realism movement in Europe of the 1850s to 1860s emphasized direct observation and depiction of nature without any romantic, literary, historic, or allegorical overtones. Much of the subject matter of the movement was the life of the common folk, but what really blossomed was landscape painting. Painters in France such as Charles Daubigny (1817-1878) and Jean-Baptiste Camille Corot (1796-1875) advocated painting directly outdoors instead of in the studio (Daubigny had a barge as a floating studio so he could paint outdoors). This was a MAJOR influence of young impressionist Claude Monet (1840-1926) and realist Édouard Manet (1832-1883). It was to the circle of realists who painted in and around Fontainebleau (Monet painted there early in his career) that Pierre Prins was drawn. Prins particularly favored the work of Corot and Daubigny. In the 1860s he met Manet who became a life long friend. Like Manet, he was always on the fringe of the Impressionists. He never took part in any of the Impressionist shows that were held from 1874­­­­­­–1886, and his work never realized commercial success, although he worked side by side with Impressionists. Only in 1890 did he have a show dedicated to his pastels in the Galerie Georges Petit in Paris. In 1897 his work was compared by critics to that of the realist Théodore Rousseau and Jean-François Millet. This work clearly shows Prins’s enthusiasm for working outdoors from what he observed. In the history of art there are many artists who delighted in depicting the nuances of clouds. 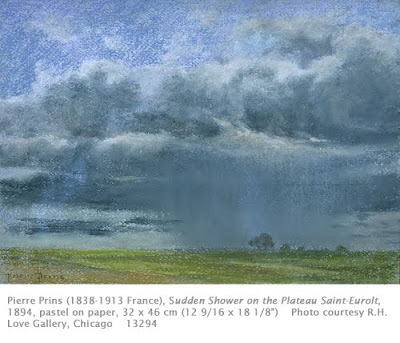 Using the pastel medium, Prins excelled in his studies of clouds at various times of day. His favorite subjects were depictions of the sky and sunsets. In 1907 Prins was shown in a gallery where critics were enthusiastic about his work as an “accomplished Impressionist,” this at a time when Picasso produced the ground-breaking Cubist work Demoiselles d’Avignon. Many of the works Prins showed at the time were thirty years old, ironically. There is an island in the Seine near Chatou now called the Île des Impressionistes. The Impressionists liked the spot because they felt it offered good subject matter of reflections on water and views of the surrounding countryside. The Musée Fournaise on the Impressionists Island has a collection of Prins’ work, as well as the history of the famous painting by Renoir done when the building was a restaurant, Luncheon of the Boating Party. I enjoyed reading your blog and viewing photo you've posted.. I just love it.. Keep on posting interesting photos and paintings..